From the first page, this brilliantly illustrated picture book woos readers with strong, realistic paintings of people. A distinctive black man’s face floats in a dark night sky and the text explains that he is someone’s dad. Faces—in skins of all shades of black, white, and every color in between—radiate on each page. 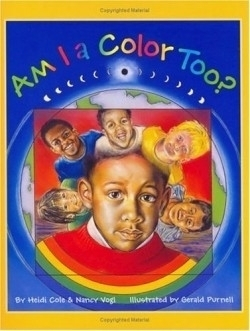 When Tyler, who is bi-racial, asked his white grandmother what color he was, this book was born. Tyler’s mother is co-author Cole, an actor and writer, and his grandmother is Vogl, a motivational speaker and co-author of Chicken Soup for the Single Parent’s Soul, which includes stories about Heidi and Tyler. Told from Tyler’s point of view, the book shows the beauty of the boy’s parents and how, through their smiles, they are more alike than different. Both of them are part of him. His parents have names for their skin color, ones he hears and knows. But if they are “black” and “white,” is he a color too? Tyler sees many colors, but he wants “to find a word that fits me like a shoe.” He says he sees that people sing, dance, smile, dream, think, feel, and love in every color, and in the end he realizes that he is Tyler; and he is a person, loved for who he is. The award-winning illustrator created each page as an original work of art. Purnell varies the images between soulful renditions of Tyler and his family, and joyous faces and gestures of people who are proud in their own skin. Backgrounds are kept simple, allowing the people to provide movement and vitality. As a picture book, this format provides a matter-of-fact approach to a sensitive subject. Tyler internalizes the conflict that some people feel when they don’t fit into common labels. He is real, and his reality comes through the text and images. Tyler struggles with the language and with society’s perceptions, and he wonders why people label other people by their skin color. He sees a much broader range, not only of color but also what’s inside each person, regardless of their skin color. Tyler says what many others cannot—he is a boy first, not a color, not a word. This book shows, not merely tells, readers that what’s important is being loved, whatever skin they’re in.